SnowVentures: Hiking From Aspen to Crested Butte! 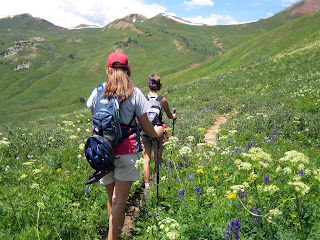 Earlier this month some friends and I hiked from Aspen to Crested Butte during the peak wildflower season. Although, we had a few hours of rain, sleet, thunder and lightning the sun eventually came out and the views were spectacular. Its not a difficult hike but it does take about 6 hours. I highly recommend this hike to anyone! If you find yourself in Crested Butte, you have to try the Secrect Stash restaurant for the BEST pizza. Some friends enjoyed the famous Figilicious but my favorite is the KGB with chicken.